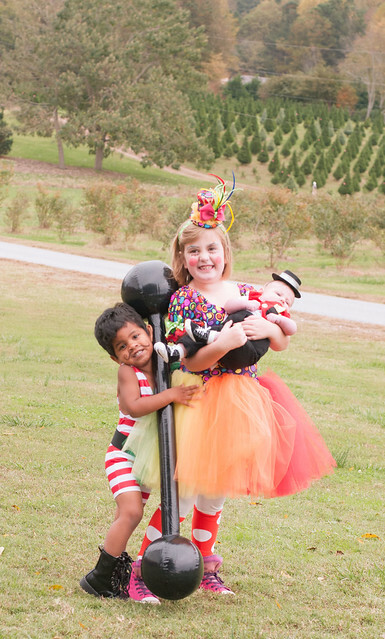 First up, I just gotta share our Halloween photo. 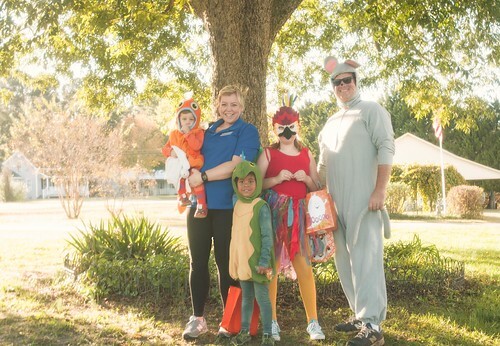 Every year the kids (mainly MM) want to do a family theme. 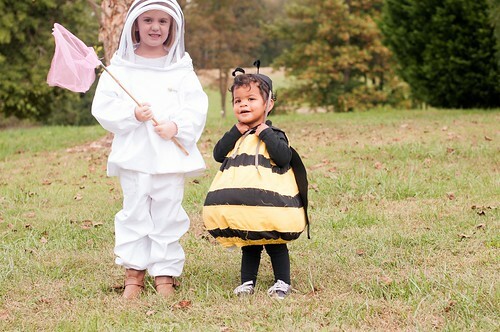 One year it was a beekeeper + bee. 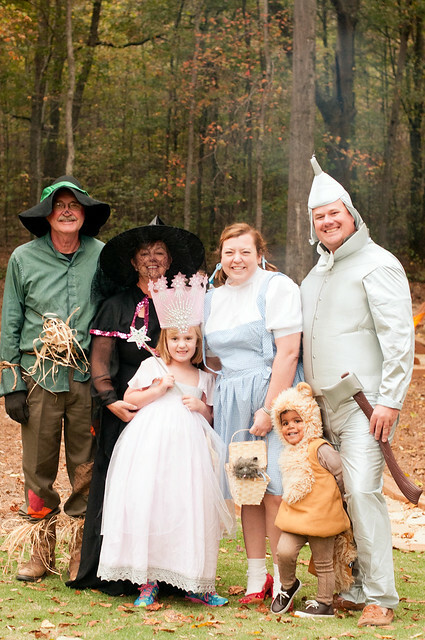 One year we were the Wizard of Oz. One year it was a circus. 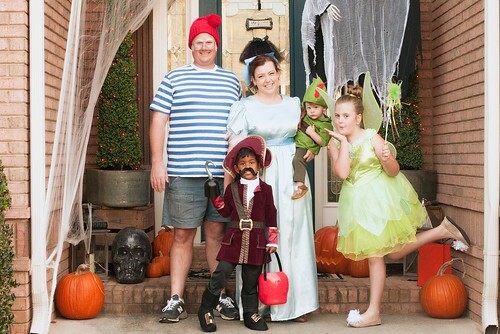 Last year we were Peter Pan. And this year we were a pet store. I was the employee (I got my PetsMart shirt + name tag off eBay and felt very official, HA!) and the pets I had for sale were a goldfish, a lizard, a parrot, and a (giant) mouse. 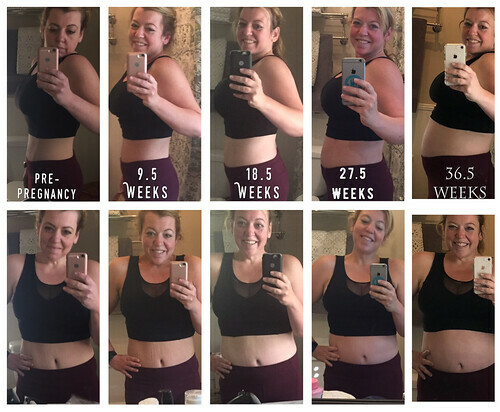 Okay…on to my third trimester recap. So I’m really happy with how things are going. Well, other than the throwing up. Every week or so I wake up and throw up…a lot. It’s only been during the third trimester (I only threw up once in the first trimester) and the only connection I see with each incident is eating dinner later at night/AFTER I work out. I think my muscle repair keeps my stomach so “smooshed” because of the giant baby it can’t digest meals very fast and if I eat too late…well, it’s not a good thing at all the next morning. I finally peeked at the scale yesterday at my regular OB appointment (I close my eyes every other time) and I’ve gained 32 pounds. And I’m okay with it (but not really, HA!). I am so proud (again #tootingmyownhorn) that I did not miss a single workout this trimester. Nothing about my routine has changed. I do cardio machines (usually elliptical) five days a week (at lunch), Zumba three days a week, and yoga two days a week. Plus I walk a ton. Taken at 34 weeks by my dear friend, Amy Paulsen. Sure, it ain’t as pretty as it used to be, but I get it done. An Instagram post at 35.5 weeks after a normal Zumba workout. And considering I was on bedrest with MM at 26 weeks, 6 days and was limited to five minute showers a day–to think I take an average of 15,000 steps/day (some days as many as 22,000!) 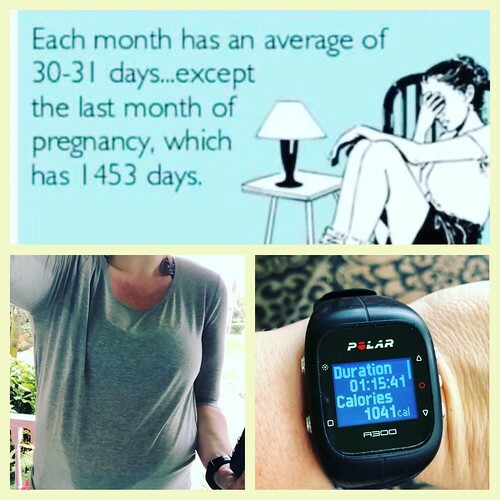 and workout six days/week (and do four days where I do two-a-days) at 38.5 weeks pregnant? I am so proud. Go me! Lordy, y’all, the purchases! That’s really all I can say, HA!! 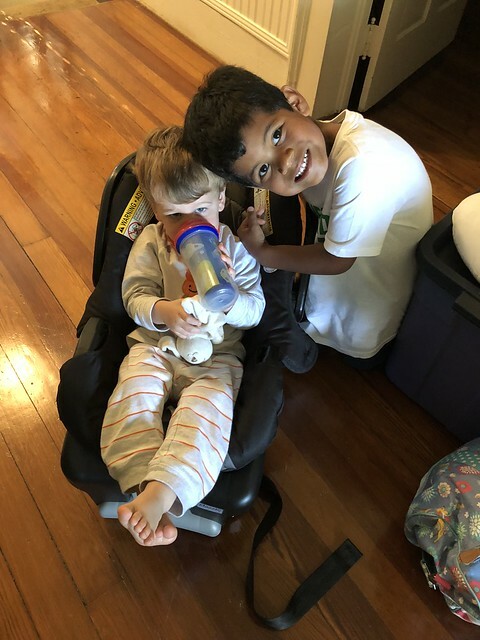 As far as necessities I got Rock ‘n Play (I gave our old one away and it’s my #1 newborn necessity), and the Boppy, the My Breast Friend pillow (#1 breastfeeding necessity), Dr. Brown bottles, and the Boppy Lounger I loaned were all given back. Lala trying out the new baby’s car seat. Gotta get that thing installed. So basically I’ve just been buying fun stuff. HA!! Here’s a little sneak peek of the bee-theme nursery. It’s not all done yet because I do want to add some personalized girl/boy stuff once baby arrives. I’ll take a ton of pictures when it is finished and post on here, promise. The print/picture came from here. 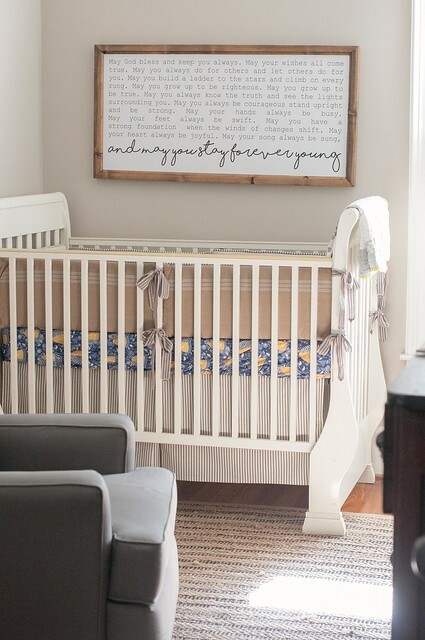 The bedding (bumper + crib skirt) were custom made by this Etsy shop (I provided my own fabrics because I wanted a specific look). The crib sheet came from here. I have a few newborn boy items leftover from Lawson (most were given away or sold), but I literally had only one newborn girl sleeper from MM so I have bought a couple of girl sleepers (and kept the receipt) and even this adorable headband. This is getting exciting! 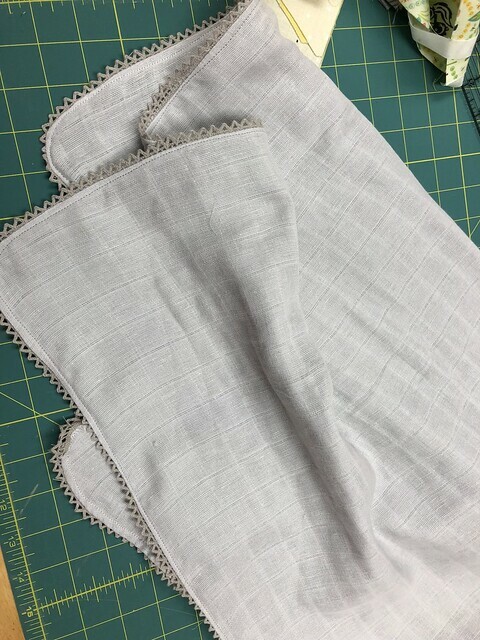 I bought some muslin on Etsy in grey and light yellow/beige and have sewn a couple of swaddle blankets that I trimmed with vintage lace I had on hand. The other purchases I’ve made can be found on my post about what to pack in your hospital bag if you’re a repeat c-section and/or low supply mama. Guess who has an official birthday?! Sorry for all!the!explanation!marks! but I’m just a wee bit excited. This Monday (November 6th) at 7:30am the newest Baby Cooper will be making their entrance into the world and I’m over the moon excited/anxious. Excited to met him/her, but anxious with all the things I have to do this weekend (get a spray tan, decorate the entire house (minus trees) for Christmas, clean and put up every piece of laundry, buy groceries, get my oil change/car inspected/cleaned, play musical car seats in the van as we add another car seat, pack the other three kids for some time at my parents’ house, etc. You know, just the necessities. 😉 Oh lord, the to-do list is a mile-long). And then I’m already anxious/apprehensive about the whole sleep deprivation thing (yours truly love some sleep), but I’m so excited to meet this sweet baby…and get my body back (and sleep on my stomach, just keeping it real, y’all). Praying and excitedly waiting to see precious baby pics! Wonderful news! I can hardly wait. Prayers for all are going up. So Excited for you and all of the Family. New Babies are so much fun and a God given Treasure for life. Praying everything goes smooth for you and baby B. You are Awesome ! !